Summary: Even as we feel great sadness at Clarence’s place in the world, we find equal joy in watching Caine perform the character with such heart and soul. In an English seaside town in 1987, 10-year old Eddie (Bill Milner) lives a dull existence in the retirement home run by his parents (David Morrissey and Anne-Marie Duff). In this place, death is a regular occurrence, and Eddie has become fascinated with the thought of what happens afterwards; so much so that he has taken to hiding a tape recorder under the beds of those closest to popping their clogs, in the hope of capturing the sound of their departing spirits. Unsurprisingly, Eddie is considered weird and generally to be avoided by fellow school pupils, and he makes no effort to convince them otherwise. Things change when Eddie discovers Clarence (Michael Caine), one of the home’s newest residents, attempting suicide in the driver’s seat of his clapped-out van. Although ex-magician Clarence is initially none too happy about being saved from his intended fate, the two begin to develop a mutual curiosity for each other’s lonely existences, and slowly a tentative friendship grows. Michael Caine is an actor whose on-screen persona has become warmer and more affectionate as he has aged, and here, with the simple story allowing his character to take centre stage, he gives a really terrific performance. Clarence is full of regret and sadness, and Caine’s expressive face and deeply sorrowful eyes are a gift to director John Crowley in conveying this. One scene in particular, when Clarence stands looking into a mirror longingly repeating the name of his late wife, is deeply moving and memorable. 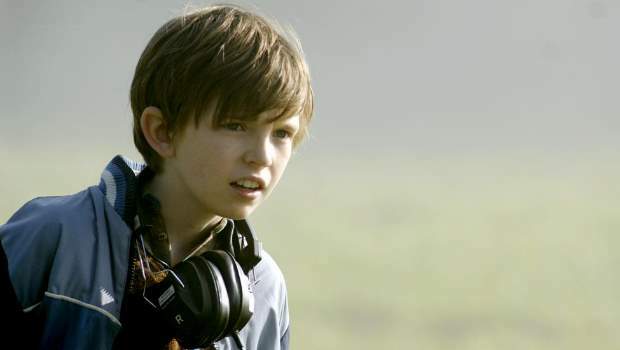 Bill Milner is also very good, and amazingly natural, in what is only his second film appearance, following an impressive debut in 2007’s Son of Rambow. The two actors make this odd friendship seem very real, and at times very funny too. For such a seemingly small film, Is Anybody There? touches on a lot of weighty issues, and it occasionally feels like there is too much going on for an audience to really get under the skin of its characters. But writer Peter Harness does a good job of tying the characters and subjects together; a sub-plot involving Eddie’s parents’ marital problems initially seems extraneous to the main story, but Harness skilfully connects it to Clarence’s situation in a nice little scene towards the film’s end. Is Anybody There? has sadness at its heart, but Crowley and Harness keep it from veering into depressing territory by balancing the more introspective character moments with a handful of good comedy set-pieces. Ultimately this is Michael Caine’s film though, and even as we feel great sadness at Clarence’s place in the world, we find equal joy in watching Caine perform the character with such heart and soul.